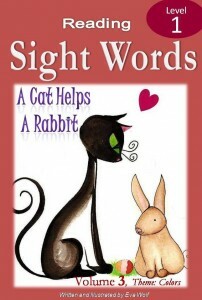 An enchantingly affectionate cat and interesting story lines make these the perfect sight word books for introducing your child to the wonderful world of reading! 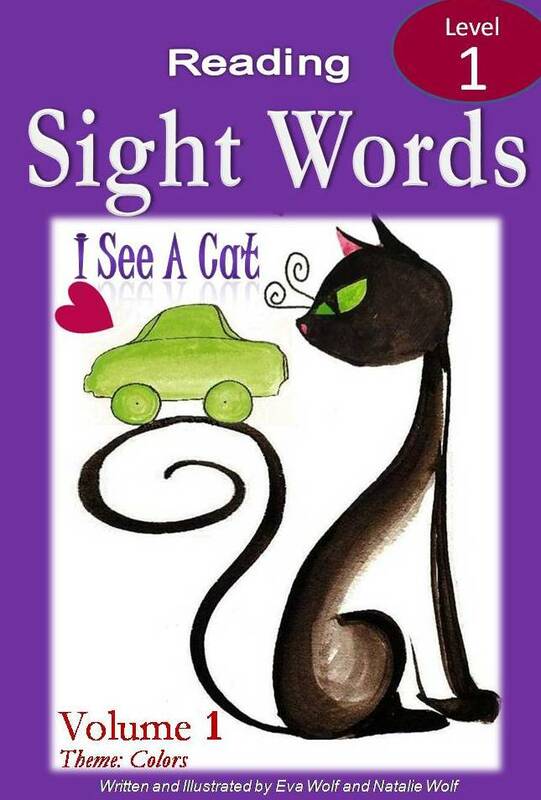 Theme is Colors: Introduces kindergarten key sight words such as: I, see, a, cat, is, the, black, like, tree, big, bird, blue, in, hat, purple, bear, brown, duck, yellow, car, green, ball, orange, pig, pink, heart, red, has. Our sight word books are divided into three or more chapters with a vocabulary word review list at the end of each chapter to reinforce material. After your child is done reading the book, help them retain the newly introduced words, by visiting our printable worksheets page, our flashcards page or our other printables page. I See A Cat introduces 30+ sight words, includes 30+ beautifully illustrations (original water colors) and 30+ pages. Also available in Spanish! Theme is Movement: Introduces words such as: on, out, under, jump, down, up, look, open, close. 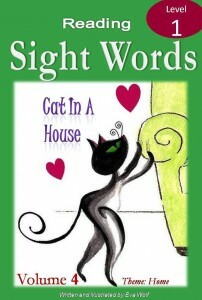 Reintroduces and reviews a few sight words from Volume 1: I SEE A CAT, such as: the, cat, likes, a, in, sees, is. These books are divided into three or more chapters with a vocabulary word review list at the end of each chapter to reinforce material. After your child is done reading the sight word books, help them retain the newly introduced words, by visiting our printable worksheets page, our flashcards page or our other printables page. Cat In A Box introduces 28+ sight words, includes 26+ beautifully illustrations (original water colors) and 32+ pages. Also available in Spanish! Theme is Colors: Introduces words such as: rabbit, not, find, thing, help. 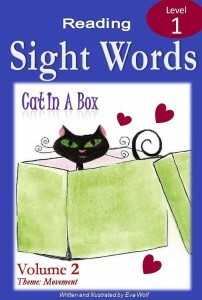 Reintroduces and reviews a few sight words from Volumes 1 and 2: such as: the, cat, likes, a, in, sees, is, look. A Cat Helps A Rabbit introduces 30 sight words, includes 27 beautifully illustrations (original water colors) and 30 pages. Theme is Home: Introduces words such as: house, door, chair, table, bed, eat and goodnight. 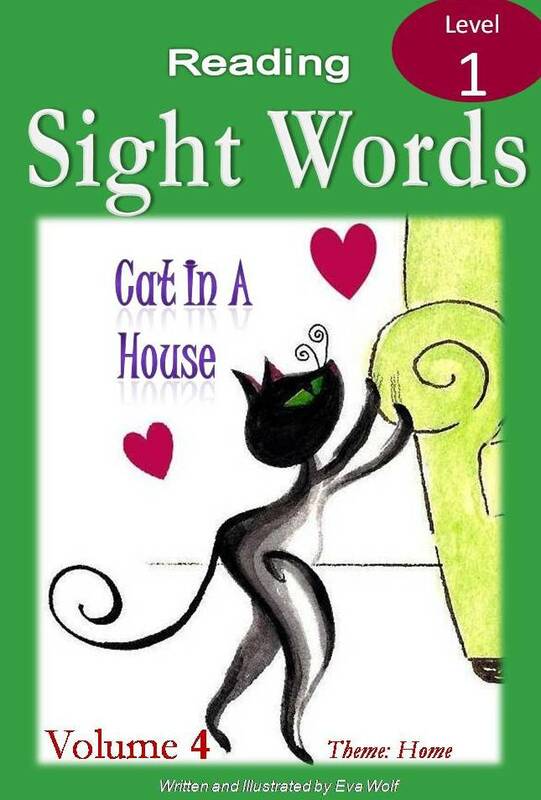 Reintroduces and reviews a few sight words from Volumes 1, 2 and 4 such as: jump, up, they, run, down, on, out..
Cat In A House introduces 20+ sight words, includes 30 beautifully illustrations (original water colors) and 30+ pages.